I have seen some elusive references from SACA members, that there could be such a thing, as a more important use of steam technology that for auto's. I wanted to suppliment that with this posting. Im going to reference a website. Its all about self sustaining buildings, and as an advocate of solid kernal corn burning, I thought WOW, what a great way to supplement fuel costs by growing them/fuel inhouse, so to speak. I was wondering what other member's here thought. Now, I do not~ want to inspire anytype of so~called gold-rush of proprietary idea's of any sort- myself included. But it seems the intended fuel-source is biomass, using a small-scale to moderate steam powered genny. I was wondering what others thought of this concept. Although I must admit, the artical(in a magazine) that pointed me to this site, was much more forth-coming with info, than the site its-self. Weve talked about solar-steam gen-sets, so I felt this topic is appropriate. Since such units could be used in suppliment. Just like wind turbine technology. While I like the idea of a distributed power system, and have done some preliminary planning for a home steam setup for myself, I do not favor using corn. The world food supply is already seriously messed up because of a poorly-thought-out government push for ethanol. Adding another market to divert corn to non-food uses seems a bad way to proceed. I understand that dried corn kernels are easy to store and handle, but using a non-food fuel seems more responsible and (probably) ultimately cheaper way to go. I remember cattails were a hot topic in the late 70's, and Harry's algae could be used. Using farm leftovers (cobs, stalks, straw, etc.) seems a good approach. Another idea was to make a deal with a tree service. They often have more chips than they can sell, particularly after big storms, so you can sometimes get them cheap if not free. Once they dry they make a good fuel and can be handled by augers like corn. Just don't use willow or pine. The bottom-line is almost all[if not all] of the potential fuel-sources do infact need 'solar-energy' wither its internally supplied as in the vertical-farm model, or otherwise. Such as windfarms, by definition, solar/light-enrgy, plays a key role 'over-time'. Im about to cook dinner[again, seems I do it every night : ) ]. My wife is slightly anemic, So, rather than making her eat cornflakes every morning, we eat red-meat allot, for diner. Trust me its better that way. Refering to the steam engine community in general,(in a loose sort of way) well, quite frankly 'were not a bunch of vegetarians' [cough]. But im sure some are and that's ok, only adds to diversity. But I do like the Vertical Farm Idea.. Here's how dinner looks before I figured out how to get it on the charcoal-grill. See attach- Im marinading it there in the WOK. So anyway, things were going pretty good. 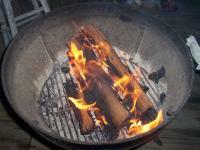 I said well, I have some nice hickory wood that I use in my smoker, what the hell, lets burn it in the BBQ. I was so proud of myself, I had the onion's and peppers on there by then. Edited 3 time(s). Last edit at 01/05/2009 08:54PM by Jeremy Holmes. Then the damn coals went out. You just cant win with these things. That that vertical farm stuff, is probably the closest thing to a biosphere-model in this day and age. Im ALL FOR IT. All renewable fuel schemes have there niche. Ever wonder why people enjoying the sunshine in florida actually care about all this stuff? You would think it would be somebody in Nebraska. I like the 'White Throttle valve' better, since its valve geometry seems more symmetrical. I think Jim's remark, that if you have one of these on your steam car, use all of the range, especially pedal to the metal upon un-impeaded acceleration. Considering this, in my mind the engine can do the most work as efficiently as possible, under flat-out un-impeaded steam to the engine. Like Serpollet did. "Absolutely essential as the early Serpollets had no throttle! [March 1, 2003] -David N."
Damage to throttles that I have seen, with something like twenty steam cars, is always pitting from water. This is because the old throttles were made from rather common steels in those days, nothing like what we have in the way of corrosion proof tool steels today. The cars have stood for years and water remains in the throttle causing the pitting and corrosion. From an operational standpoint, the White will not shut off if the bronze housing starts rotating. This is super easy to prevent, as I described. The Doble foot throttle can so easily be misadjusted, by amateurs that don't know how it is supposed to work. It is a matter of delicately adjusting the stem in relationship to the cam face. If it is wrong, you can't open the throttle with both feet on the pedal and both hands under the dash, pushing like mad! Correct corrosion proof steel and Stellite facing cures this completely. I have never seen wire drawing on either throttle. Peter, The Series E Doble has the cylinder-steam line drain connected to the hand brake. Pull on the brake and the valve is open. 'I have never seen wire drawing on either throttle.-Jim C"
Id like to say I agree with Jim on the wire drawing observation. This comment from the thread, is the one that brings somethings together within the recent timespan of discussions. Back to the topic of Vertical Farm. The bottom-line is almost all[if not all] of the potential fuel-sources do infact need 'solar-energy' wither its internally supplied as in the vertical-farm model, or otherwise. Such as windfarms, by definition, solar/light-enrgy, plays a key role 'over-time'." "TDP energy farms can be used as a habitat for other species and as recreational space for people. TDP plants can be located near agricultural waste, landfills, and markets reducing transportation cost and risk." I like the idea of any sort of external combustion engine system, supplementing the vertical farm model, what I found interesting is that a steam turbine is part of the current model, recirculating Co2 from its burner/boiler into the farm. Obviously you cant make solar power at night or wind power when theres no wind. The energy needs of such a building would be robust. You could not rely on batteries. Using fuelcells would be out of the question, since the water is better used in the farming section. Interesting concept nonetheless. Oh so true. The Doble throttle is a stinker to set right and have it stay where you put it. Have to do it hot as the body expands and then you need to do it all over again. Both feet on the pedal, two hands under the dash and push like mad till you lift off the seat. Still won't open. The cam adjustment is very critical, only the most minute clearance. No wire drawing; but definitely pitting from water corrosion. The White is better and yes, you need to be sure the gland nut is tight as can be or it will rotate. Easy to pin and some cars had this. What tipped me off, was your mention of tri-valent hard-chrome electro-plating area's 180 and 181 from this link. Then machining, you had to have done that with some sort of grinding fixture. If you had good enough electroplate adhesion and thickness to get away with that, I have no further questions. I use a work hardening(heated cycles) process for, in my case, a single surface, which will either rate-in right away, or leak and fail, right-away. The operation is intermittant not continious. For my application I must bring a seal assembly up to operating temp, then seat it with operating pressure/temp, on the bench. In this way, the surfaces are somewhat ductile for a short period, and at the same time the seal break-in occurs and seal friction decreases as operation becomes correct, the seat surface work hardens. Many people really dont understand rate-in periods. I would like to hear some good news about your book-set, Jim. Im in the process of reconstructing my hardcover reference library, im allocating some space for your book. Edited 1 time(s). Last edit at 01/10/2009 11:27PM by Jeremy Holmes.